In March 2000, Joseph Bottum complained in The Atlantic of what he called "the soundtracking of America." "America," Bottum wrote at the time, "is drowning in sanctioned music, an obligatory orchestration cramming every inch of public space." He was not ranting against the decadence of pop music or lamenting the enfeeblement of classical music. Rather, his subject was the place of music in general—from Bach's fugues to Bono's falsettos—in America's moral landscape. While the popularity of other arts has faded, the popularity of music has, so to speak, charged up the charts. This can be attributed, Bottum suggested, to the rise of what Alasdair MacIntyre has called "emotivism"—the idea that moral judgments should be determined by positive or negative feelings rather than by reasoning. Music, which has the capacity to communicate immediate, non-linguistic feelings, has flourished under emotivism while the so-called rational arts—poetry and drama—have struggled. We may live in perversely Puritanical times, as Marilynne Robinson has argued, but it is music, not the church, that tells us what "obvious and officially appropriate emotions" we should feel. 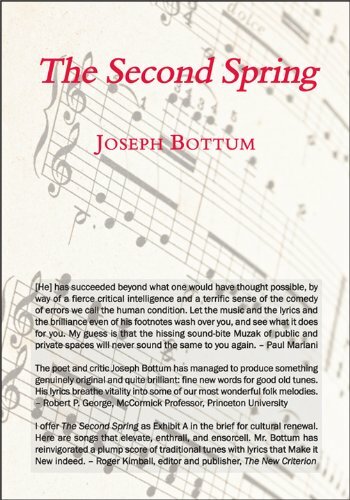 And lyrics, Bottum argued, cannot make up for music's fundamental incapacity to express complex thought. They can't introduce or maintain "any ideas the music itself lacks." Good poetry cannot be set to music, and good lyrics, which of course can, read like "serviceable parlor verse" at best.